Wanting Luke 4:18........x457.......I believe that most Christians today are very very close to what God wants. We all want to see people get saved. We want to see people get healed--and be delivered from the snare of the devil. We all want to see the poor fed and clothed. Most of us realize that God inside of us desires these things--and most of us live for the times when God works through us to reach out to the lost and the sick and the needy. But perhaps we are missing one final step in the ministry of Christ and the fullness of what God wants. Do we really desire to see others freely released to serve God and minister? Do we really want to see the whole church in ministry? Do were really want the apostolic method--the picture painted for us in the Bible?. The WhoWhatWhy --of ministry and church government......x452...........Who what why where when and how. This bible study directly answers these questions about ministry--authority and the operational plan that the Bible gives us for the Christians church. We need to turn away from our traditions which hinder God--and embrace the bible operational plan for the church. Power/Authority Scriptures.......x277.........Study authority from the Bible. Look at every use of the word in this study. You will find that Christians have been given authority over sin-sickness and Satan. But we are commanded by Jesus Himself 3 specific times NOT to use our authority one over another amongst ourselves. speaking the truth in love.........x307.............The areas of the Bible which speak of new covenant ministry gifts are always attached to the love of God in a big way. Read these verses in the context that God set them in. You will see that there is no way that ministry is authority over others--it is the way that God will operate through all of us together--the way for us to be glorious in Him--the way for us to speak the truth--but the truth in love. The promise of God is that if we will strive toward His glory--and freely encourage one another to these ministries--the love of God will be poured out into the earth--what an incredible promise!!. TEACHING ON EPHESIANS 4.............x74............A detailed teaching on this incredibly important part of the Bible--which presents Gods loving plan to build the church, the ministry gifts in all the body..
Authority--watch out how you use it! !.....x132............Jesus has all authority. He released His authority to all of us. He demonstrated how to use His authority in His ministry in the earth. And He specifically commanded us how NOT to use this authority. Do we follow Jesus' rules? Or do we have undefined rule in our churches?. "Authority"--what is it and who has it..........x136...............Study every use of the word authority in this Bible study. Find out for yourself, from the word of God, exactly who has authority, and what we are to do with it. Be Like Jesus---Minister! !.........x138..........The Bible clearly tells us to walk (live) out our lives like Jesus did. And what did Jesus do?---Ministry!!. Confusion about "authority".........x156............Jesus made the definitive statement in the Bible that ministry is NOT authority over other Christians. Ministry is always service--especially among ourselves. The authority of God is meant to rule over sin, sickness and Satan--and not to rule over one another. The Magical Mystery Money Man...........x200802.........In the Bible, offerngs and tithe were animals and grain paid for sin. Somehow, somewhere in history, someone turned this concept into a money-giving systme for the Christian church. If you know who did this, please let us know! The Proof of a deacon..........x161...............Are there requirements for someone to be a minister? The Bible gives the requirements in 1Timothy 3:1-16. Tradition reads these out of context and limits ministry--why shouldn't we allow everyone who qualifies by the Bible standards to serve God? Good Works---Beautiful energy........x491..........Good works are for all of us to do. Now, the Bible says we are not saved by our works "of the law". These good works are not our obedience to God's law--what the Bible means when it speaks of good works--is ministry--serving God by operating in His purposes (see Luke 4:18)--spreading the Gospel--praying for healing and deliverance--feeding the poor--and releasing others to freely serve God (apostleship). Our energy is meant to serve God--not earthly things--not money--we all are called to serve God--which means we all have a ministry to fulfill. What would it look like--.........x481...........What would it look like if we all suddenly began to operate the church just like it was operated in the Bible? The answer is that we all would be free--that we work together freely--as the Spirit lead. And the plain fact is that it would be easier than trying to operate the Roman chruch which we strive so hard to build! It would be simple--direct--inexpensive--yet very effective to do what God wants--which is--to get people saved--healed--delivered--fed and released!! Luke 4:18--Jesus/church--all the same ministry!.........x480............In this important verse of Bible, Jesus outlines His ministry. He names 5 aspects to it: the Gospel, healing , deliverance, releasing apostles, and feeding the poor. Literally everything that Jesus did in the Gospels can be categorized under one of these 5 headings. But, exactly the same statement can be said of the church in the Bible. They simply and effectively carried on Jesus' ministry by continuing His apostolic method. This is how Jesus worked, and the church in the bible worked the same way--does your church operate this way?. Ministry--No Big Deal!..........x479.............This study looks openly at all the verses in the new testament which speak of ministry. The Bible is filled with ministry--everyone was doing it--it was simply direct effective service to God's will. It was the gift of the anointing upon every believer. It was NOT a title of rulership over others--it was NOT an exclusive club of leaders. One of our main purposes in this website is to encourage every Christian to open up their Bible and study ministry freely--without the prejudice of experience. Study ministry for yourself--and you will find that ministry is your gift and calling--a grace--a gift--"given unto every one of us". Moses seat NOT to be in the church.........x477............The Pharisees sat in the seat of Moses. This seat was the earthly representation of Christ's seat in the heavenlies--the seat at the right hand of God--the seat of all power and authority. Jesus unseated the Pharisees. By the old covenant laws, they had perfect right to have authority over Israel--but Jesus clearly brought a new rule to the new covenant. He was to be the ruler of the church. He was to be the Head of the church--to have all power and authority--and we are all members of His body in the earth--none exercising authority over another--there are to be no seats in the new covenenat church--no rulership but that of Christ. Operating the church on a Parable! !..........x471...........We all know what a "pastor" is--right? We experience "pastoral ministry" every Sunday--over and over again--right? But, what is the basis for pastoral ministry from the Bible? What does the Bible say about "shepherds"? The fact is, that most references in the Bible about "sheperds" are actually parables--not doctrinal teaching. The few areas that mention sheperds, are in fact comparative teachings which relate spiritual lessons--NOT doctrinal teaching about church operation. Pastoral Authority--something Like This?.......x470...........What is "pastoral authority"? Would you say that it is something like this: God has set some in the church who are in authority over the rest--and if you submit to their authority--it will benefit you? Jesus had a real problem with this idea in Luke 22: 25-29. Let the word of God change your heart. Submit--Over and Under.......x464...........Many of the misconceptions we operate the Christian church by come from these three words---misinterpreted--taken out of context. Which lead many to say that "God has placed some people in the church in authority"----we are to submit to their authority--they are over us---and we are under them. Dare we study these words in their Bible context?. Teaching--what We Lack.........x463...............Very powerful tradition in the Christian church says that most Christians need weekly teaching--which comes from one man--for their entire lives. The teaching of one man is the central focus of "church"--and occupies a large part of what Chrstians do when they are gathered together. We would challenge you to study what the Bible says about teaching--who can do it--how it should work in he church. The answer is that teaching ought to be simple direct and Spirit lead through any individual--and NOT from one single man--over and over and over again!. The One Man Who REALLY Understands the Bible.......x459............Biblically, there is no such thing as "clergy and lay people". This concept comes to us from the church of the dark ages, when only the local priest could read. He was also the only person who was allowed to read the word of God--unfortunately he read it in Latin--a language which most of the people did not understand! Now, of course we do not follow these ideas today--YET--we still operate our Churches with this same idea. We still sit quietly "under the authority of the pastor"--the one person in the church who can teach doctrine and read the word! What Is Ministry?........x453...............Do Christians really know and understand what the ministry of Jesus Christ consisted of? Do we really understand that He desires to operate this ministry through all of us today? Luke 4:18 describes Jesus ministry. The gifts of ministry are simple, yet important anointings which we are meant to operate within all the members of the body of Christ--so that the chruch will be glorious--so that the church will look like Jesus. 2Cor 3 Says there are 2 types of ministry--OT and NT.......x447...........What's the difference if we get our church plan and operational system from the old covenant or the new? After all it is all God's word--right? Many preachers often teach about the Bible being "all God's word"--which is certainly true--however, shouldn't we set the entire Bible in the context and order which God set it in? If God made changes from old to new--shouldn't we operate by the new changes? whether we realize it or not, the new testament calls the old testament ministry--the "ministration of death"--and states that it ought to pass away! Undefined Rule......x253............When we know Hebrews 13:17 so very well--and have never heard of Luke 22:25-26--we have a dangerous situation within our churches: undefined rule. Since we don't seem to realize that Jesus defined "rule"--we simply define rule within the church by tradition and format which has been handed down to us from the dark ages. Jesus defined rule (Greek "hegeomai") as service to others, and specifically NOT authority over others. He spoke this word as a definitive, new covenant change. How to: Operate The Christian Church....We haven't forsaken the assembly--we've forsaken the house!....x257...........The house of every Christian is supposed to be the house of God--the operational place for the church. What if we really did things this way? What if we had houses that fed the poor and witnessed the Gospel to the lost--and prayed for the sick and brought deliverance to those in need? What if?? Pastoral Authority--An Imbalanced teaching.......x263..............."Submit to authority"--Submit to them that "have the rule". This half-verse in the book of Hebrews, is, in fact, one of the major operational basis of the traditional Christian church. The problem is that we have no definition of "them that have the rule over". We teach this and operate our Churches out of balance when we do not Biblically define the Greek word "hegeomai". This one Greek word is translated as "have the rule over" in Hebrews 13:17--but this very same word is used in Luke 22:26--a very little known or taught verse, yet vitally important, since it is Jesus definition of "rule"!!. Pastoral Authority--it benefits me --right?? ?........x264............Within the church, God has "set the pastor"--the person who "has the rule" the person who "has authority" over the rest of us. If we submit to this authority, it will benefit us. If you have been taught these concepts--please open your Bible and read Luke 22:25-29--Matthew 20: 25-27--and Mark 10:42-45. Psalm 68:18--the establishing verse for ministry--Does anybody know this?.....x280......Our quiz question for every pastor and minister: What is the Old testament verse which establishes the "5-fold ministry" of the new testament? Answer: whether anyone knows it or not--whether anyone likes it or not--it is psalm 68:18. An incredibly little known or studied verse, which states rather clearly that these gifts of ministry are given to humanity--to every one--even the rebellious! Do we know this at all? Has anyone ever studied this at all?. X0608.........Selective Tithe Teaching........."Tithe" is taught very selectively. The tithe teacher ignores what the Bible truly says about tithe, and fits it neatly into his idea of "church"
X0607..............The Timetable of Ministry............How long does it take for someone to "get into ministry'? Tradition makes us misuse the Bible, wrongly define ministry, and the end result is that it takes years for someone to get to the point where they can serve God. Satan knows what the Bible says--less ministry means more people in Hell. Rule rule who's got the rule? ?........x293...........We are taught to "submit to authority"--or to "submit to them that have the rule". This is a large, common basis of Church operation. The common roman Sunday worship format is based upon this concept--of submitting to the rule of the leadership. We as Christian spend a large part of our time "submitting to rule"--"sitting under" ministry. What we have done is to stress one side of the story--we know Hebrews 13:17--but do we know Luke 22:25-26?? Jesus defines rule--as NOT authority one over another. Jesus says that Christian ministry is NOT authority over other Christians. This is how He operated His ministry--and it is how the church in the Bible operated. Jesus operated under the direct authority of God the Father--the church in the bible operated under the direct authority of Christ--the Head of the church. Just Exactly Who is "sent"/Someone had to be an apostle.......x304.....SPELL....What is an apostle? Is it a saint of old which we don't need in our modern day and age in the "pastoral" church? Did you know that it was Jesus fervent prayer for all of us to be apostles? And that the Bible says that people will not be saved unless someone does the work of an apostle? You are an apostle and you don't know it!. Tested and Proved......x322............Have you ever heard the saying "you must be tested and proved" in order to be a minister? Well, this is true--that statement is made in reference toward ministers (deacons) within the church. However, since we take those words out of context--exactly what is the "proof--and the test" for ministry? Isn't it church attendance--education--and myriad of other requirements? did you know that if we dared to read those words in context, the Bible would qualify probably about 90% of all Christians for ministry? The "hidden" apostolic command.......x330...........When we read the Bible as it is most often translated, it seems as if there were only a handful of special people who were named out as apostles. this could lead us to believe that only "some " people are really called to ministry--or even worse that the apostolic age has ended. The truth is that the traditional way of translating the Bible is to leave the word "apostollos" untranslated--and to translate the Greek apostello as the word "sent". In English, they look like two different words--yet they are really speaking the same meaning. This Bible study translates some of the hundreds of uses of the word "apostello"--from which we will find that it is used many many times--and in fact we are all to be "set at liberty" as Christians--to freely serve God in our ministry. The "Officers" of the church in 1 Timothy..........x338..........Most Churches operate by a system of church officers. A hierarchy of authority--a chain of command. this entire concept comes to us from church tradition outside of the Bible. But, doesn't the Bible say that there are "offices of bishops and deacons within the church? We must look carefully at this. 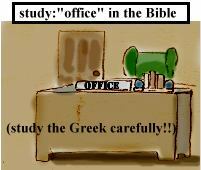 The word which is translated as "office" in 1 Timothy 3 is simply not there! It is, in fact, the word "diakonos" which means servant--(the word which is most often translated as "minister"). These are instruction for servants--NOT the setting up of a hierarchy of authority or chain of command!!!. Leadership Is Not Biblical If it Does Not release Ministry.........x354..............Jesus defined leadership as service to all--and He brought the free gift of ministry to all those who believed in Him. Jesus released all His authority to groups of people whom He called apostles--He released thousands--The clear example of Biblical leadership is to release others to freely serve God. We have no Biblical right to "hold under authority"
X0609..........The Unanswerable Tithe Question..........Tithe is hammered into the minds of many Christians. The question asked is "Why is tithe in he Bible?" The answer provided is that it is meant to be the way Christians give money to the church leader. This is the wrong answer. This is the right answer.......TITHE IS IN THE BIBLE, BECAUSE IT IS THE WAY PEOPLE HAD THEIR SIN FORGIVEN BEFORE JESUS WENT TO THE CROSS. We obey the lords supper in 1 cor--but what about the rest?......x366...........Has this ever happened in your church? You celebrate the Lord's supper, and read the instructions for doing this from 1 Corinthians chapter 11--and you carefully follow these instructions--since the Bible calls them "ordinances"--rules to follow. But did you know that the ordinances continue through chapter 12, 13, and 14--and are called commands of the Lord? One of the central ideas of this website is to encourage all Christians to look at these rules--commands--ordinances--and ask honestly if we are truly following the word of God in our meetings. KING JAMES--WHO WAS HE ANYWAY?---Shortly after Henry the 8 came king James. You have probably read the Bible translation that bears his name--and good for you--because the king James Bible is generally speaking, one of the most accurate Bible translations. But, who was king James? He, like the other protestant monarchs of his day, believed firmly that he was in his position by God's will, and in fact all his decisions came from God (something called the "divine right of kings"). King James "ruled" with "authority" " over" his "subjects" who had to "submit" to his "God-given "authority". When the translators were doing their job for king James, they tried, everywhere they possibly could, to insert these words--and the concept that the common people ought to "submit to the rule" of the king. WE Pay--Do They Obey?.....x367............The church in the Bible gave all of their money to the poor within the church--for any one who had lack. the leaders did not receive a tithe, nor did they use the money that they distributed for their own welfare. or just for their own ministry. They did not use the money to build a large building--the collecting of money was "for the saints" for all---not to pay the leadership who was the "full-time ministry"
What makes up the body of Christ?.....x370............The description of the new covenant church is as a body, made up of varying parts, each of which has a function, which falls under the categories described--Some, apostles; and some, prophets; and some, evangelists; and some, pastors and teachers;"
What God Could Have Said--But He didn't.........x371..........When God wrote the Bible, and He was going to relate the new covenant gifts of ministry, He could have easily related them to the Old Covenant Levitical priesthood. But He didn't. Instead He related the New ministry gifts to psalm 68:18--one of the most little known or little studied verses in the Bible--which says simply and plainly that these gifts are given to all of us, not just to a delegated, designated, anointed, appointed, group, who has authority over the rest of the church. Pastors instead of Apostles....x373............We have many many pastors in Christianity today.We operate the church by pastoral authority--something which cannot be found in the Bible--and is Biblically defended by the vaguest of scriptures. On the other hand, the word of God is filled with apostolic ministry. Our sad situation is that we have a misdefined concept of pastoral ministry, and totally ignore apostleship--one of Christ's greatest gifts! In this Bible study you will find out that Jesus calls "being a good pastor"--the act of releasing apostles!.. Who Can Be a Prophet?.......x374........In the Old covenant, only certain special anointed people were chosen of God to be prophets. However, there is a clear and radical change about prophecy in the New Covenant. "Sons and daughters" may prophecy--and the church in the bible operated by this principle--they understood the vital importance of the prophetic gift in every born-again Spirit-filled Christian. the prophetic gift gave the operational instructions from God. There are mighty promises of God in the Bible if "all prophecy"---why don't we strive to this high calling of God?. But Wait!---You Need a "covering".......x377.........Many teach that ministry needs a "covering". The idea being that every minister needs someone who is "in authority" over them in some way. This concept comes from an obscure, out of context verse in the Old Testament and has absolutely no example in New covenant church operation at all. What is very interesting is to research the word "covering" in the Bible. We then find that there is someone who has the ministry of covering---Lucifer!!. The Opposite System........x394...........In the Bible, the money was NOT given to leadership to build and operate a church building. It was Spirit-lead giving--to the poor in the church--so that no one had lack. All the houses of God were cared for, they did not exalt one man's house over another. X0604.............The Poor Ministers......."Ministry" according to the Bible, has the right to ask for help from others, including monetary help. The big point we miss is that ministry is for all of us to do at different times, as God decides. Not, "full-time--paid--professional" ministry. Priest--To---Pastor .........x417............Where do we get our concpet of "pastoral authority" from? It is simply the remnant of the government of the Roman empire still within our churches of today. We challenge all Christian to study the history of the Christian church--with an open mind and heart. To Set AT Liberty............x422..............Jesus saves---Jesus heals-----Jesus delivers-----Jesus releases! It took the church hundreds of years to recognize the 1st 3 statements made here--that salvation and healing and deliverance are gifts of God through Christ. But we still have not realized that apostleship--the setting at liberty to freely serve God--the free release to minister--is also a gift of Christ. For hundreds of years, tradition put all these things under "church control"--3 are free, but ministry still is not. It's all about freeing Christ to do His ministry fully again in the earth. SUBMIT--SUBMIT---SUBMIT!! !........x315............What does this word really mean? does it mean to line up with military commands of leadership? And who exactly does the bible say we ought to submit to --is it the pastor? (answer--no!). Absolutely there is an annointing and gift of leadership within the church---but is that leadership due our complete and total submission? The submission of our will, (you can't talk back to it) our ministry (you can't serve God in any way that competes with it) and our money (you have to pay tithe for it's service)? Study all the uses of the word submit from the Bible--in context--and see what it really means to "submit"
Unity Based On Commonness............x436...........The church described in the Bible had a unity based on commonness. They operated the church on a common level--specifically, ministry was NOT authority one over another. They had "one accord". This is not our idea of uniformity (file into church--file out--keep quiet)--this is described in the Bible as "a rushing wave of God's power"--in all the people. Does your church operate in this way?. serve-love-lay down your life........x299..........Jesus taught us to obey His commandments--which is described in one word--LOVE--to God and our neighbor. We are all meant to love God--and demonstrate this love by loving and serving others. Service is ministry--we are all meant to minister to others--it is the command of the Lord. Covering the Leadership of the Holy spirit--(Satan's big Plan)..........x437.............Lucifer had the ministry of covering. The Bible sets forth the rules on how to operate as the church--they allow God the Holy Spirit to speak through everyone. The Bible shows us that this is how His church would operate and be given direction--God speaking through anyone--NOT just through leadership. But the ministry of the Spirit is covered by our misconception of authority and operation in the church. X0619...........Jesus Says NO Storehouse............Folks in tithe-teaching churches are told that the church is the "storehouse" that Malachi refers to. They probably never look up the other reference to storehouse found in the Bible! Wrong government holds incorrect doctrine in the church..........x96...............Church history (and the beliefs that most still cling to!) shows us that wrong doctrine in leadership corrupts an entire body of believers. The key to this is the common misconception most churches have with regard to church authority and submission. How is it when you come together?...........x206............In 1Corinthians, God gives us commands about how to operate whenever we are together. Are we obedient to these simple commands? Maybe we should review the manual before proceeding with another "church service"! The Bible shos us 3 simple steps to apostleship---do you know what they are? Jesus description of a good pastor--John 9-10........x233...........There is only one place in the Bible which deals with pastoral ministry definitively. If we study it carefully, and in context, we will find that Jesus in these chapters, makes an apostle, and calls this release to ministry a good pastoral work. WE Get the Blood---But What About the bread and Meat?........x508...........Most Christians understand about the blood of our Savior Jesus. We understand that He shed his precious blood for the forgiveness of all our sin--it is the blood which saves us and heals us ("with His stripes we are healed"). But--do we understand that Jesus also called Himself bread and meat? Do we understand the significance of the offering of Himself--His body--as bread and meat? We celebrate the Lord's supper--and know that "all are called to the table"--but do we realize that the bread and the meat are the release that Christ brings--for all--to ministry?!! Sabbath purpose..........x513...........The purpose of the sabbath day, according to the Bible, was for sanctification. The sabbath was for "getting your sin cleansed"--a day when most of Israel could not work--except for the Levites--the priests of the temple--who did their work of carrying on the activities of making blood offerings etc. which had the purpose of sanctifying--but only for a time. The rituals of the sabbath had to be repeated over and over again--since the "blood of bulls and goats" can only cleanse the flesh temporarily--But we are new covenant believers--right? We have the blood of Jesus Christ--which is meant to "purge your conscience from dead works to serve the living God". Question to the 21st century Christian church---why the endless repetition of a sabbath ritual?. Real Stuff About the Tithe........x514.........Open your Bible with us--and study some of the concepts often taught which supposedly speak of tithing as a necessity for Christians. Let's look at these teachings in context--and take the Bible for what it says--instead of what our dark ages traditions say!. John 6--the whole chapter........x523........Study with us this chapter of the word of God. We will see the message and action of release that Jesus brought into the world. Release was a central part of Jesus' ministry--He "sent away" all the people--He released everyone who believed. Question: Isn't "Jesus Christ the same, yesterday, today and forever?". Question #2--where is the release in our churches today?? 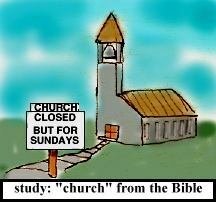 Instead of Sundays--.....x526.........It comes as a shock to most Christians to realize that the church in the Bible had no strict, "holy day of obligation" (all must attend) on Sundays. The fact is that they met every day, in small groups--on a constant ongoing basis--and thus were more effective to carry on witnessing--healing--deliverance--feeding the poor--and release out toward the world. Church tradition turns churches inward--(needlessly!) --when the Bible example is to operate most of our ministry outwards toward the world--after all they are the ones who need salvation--right??. Acts 20----Give To The Weaker! !.........x533...........The Bible instructs us to give to the weaker among us. The church--as the Bible describes it, is a body of individuals--all who are unique--yet all have a function. Our tradition tells us that we should give to the strongest member--to the "person in authority"--exactly the opposite of what the Bible asks us to do. The question we humbly ask is this: what if--we gave to the poor within our churches? The Bible says we would be glorious if all ministered --and if all had the support needed to operate in ministry. What if? 1Thessalonians study//LKAR......x535.........Read through his short book of the Bible and take notice of the nature and operation of the ministry described. The cooperation on a common level--the apostolic operation of brothers in the Lord. Compare it with our idea of pastoral authority and church format. Again as always we simply ask you to study these things for yourself! 1Peter 2--Jesus Shepherd/Bishop..........x536............Often we have seen the very last verse of this chapter of the Bible--taken out of context. It is one of the very few places in the Bible which use the words "shepherd" (pastor---Greek: "poimen") and "bishop". This last verse is looked at--and immediately defined by experience and tradition--"You see--pastor and bishop are in the Bible--they're the rulers of the church--see it's Biblical--!" What if we read the entire chapter? What if we looked at what the Lord is speaking about--instead of our tradition and experience? If we did, we would see that the pastoral anointing--(as well as that of a bishop)--is the gift of releasing others to ministry--the act of setting others free to serve God--The exact opposite of our common tradition of "pastoral church authority"--!! 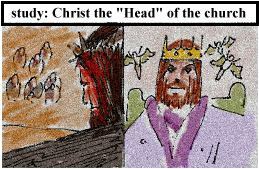 Jesus is the Only Rightful ruler!.......x538.........Jesus is the King of kings and the Lord of lords--and we all say "amen" to that of course. but have you ever read the rest of that verse in the Bible? It says that Jesus is also, the "only Potentate". What does this mean? It means that "Christ is the Head of the church". It means that He is the Head of the body. It means that He is the only One who has God-given right to be an "official ruler" in Christianity. a "potentate" according to the Greek definition, is someone who is an official ruler--and Jesus is described as the ONLY potentate. We as individuals, and we as groups should only have one Ruler--one Head--Jesus Christ our LORD!! In order to be free in your faith--you must minister!.......x212............In 1Timothy 3, the bible seems to be saying some boring, familiar things about deacons within the church. If we translate this area of scripture carefully, we will see that the word of God is telling all of us that in order to be truly free in our faith, we must serve God!. Philip asks a doozy.....x518......In the book of John, the apostle Philip asks Jesus a question--to "show us the Father". Jesus answers with a simple explanation of how the power (authority) of God is going to be distributed in His church--in His kingdom. Is it just to "some" people who then exercise authority over the rest? Nope. The authority of God, comes direct to ALL BELIEVERS--from Christ Himself--and not through others--NOT one over another amongst ourselves. Well, where did we ever get such an idea in the church (ministry=authority)? Study history and you will find out. Peter==Pater--papa--pope--priest---pastor......x519.........The tradition of the Roman church tells us that Jesus designated Peter to be the first "official" leader of the church. Their tradition then lays all their experience and traditional changes upon these verses (Jesus was naming a "pope"--who is the "official pastor of the official church--who "owns" the priesthood--a priesthood which we carry on with our concept of "pastoral authority") We go a long way in the wrong direction on some simple verses. Jesus was simply prophesying and releasing Peter to lead --but how? What does Jesus and later Peter say shepherding or "pastoring" really is? Guess-what! It's the annointing to release others to serve God---somebody read the Bible!! A list of people that Paul worked with (fellow soldiers--apostles)......x520.......Historians and theologians often line up with the common tradition that Paul was somehow a "one-man" ministry show who went out and got the whole world saved--all by himself. Some will admit that he did always work with others--but they still believe that he was the "great leader" of the early church. The bible truth is that Paul was simply the guy who had the job of writing the letters to the churches, after he and his fellow apostles had brought the Gospel to an area. They all worked together--as equals--each doing the part that the Leader commanded. Oh, and who was the Leader? Simple; Christ the Head of the church--speaking to His people, through the leading of the Holy Ghost. God as the Leader----what a concept!! Jesus requirement--NOT money--ministry!.....x524.......Jesus made a requirement to His followers (one that is soften overlooked by our traditional way of reading the Bible!) --that was to serve God--to minister--to walk out a priesthood in the earth. We in our tradition of church have a requirement---MONEY. Isn't this true? Can you "get ahead" in your church without giving money to the leaders? Can you attend your church without giving "properly"--as tradition ordains? Jesus' system will get more people saved--if only we would adopt it in place of what we are so sure is "RIGHT"!! All uses of the word diatithemi........x101............Jesus only uses this particular Greek word one time--in Luke chapter 22--the place where He makes the definitive statement that authority one over another is NOT what New Covenant church ministry is supposed to be. The concept of servant ministry is the central operating principle of the New Covenant. The "Collection"--For the Saints! !.......x106...............In the New Testament Bible church, 100% of the money which was collected was for the poor within the church and NOT for the leadership of the church or the operation of a church building. 1Peter 5--who's "subject" to who?.....x107.............The rules of church authority according to the Bible are that we all cooperate with one another on a common level. In the Bible church submission was a 2-way street--not 1-way authority as in worldly government. 1st Century Jewish perspective..........x108.............The church which is our example from the Bible consisted largely of Jews. This is the perspective which God chose to bring us the New Testament. They understood clearly what the tithe was--what the temple and the offerings consisted of--and they clearly understood what Jesus had freed them from in the New Covenant which they embraced. 1 Timothy 3---all about the House.........x109.........The Bible has been translated by experience--specifically with regard to the church and it's operation. 1Timothy 3 tells us about simple ministries of service in the homes of Christians, and not our Roman concept of "church". 2 Houses of God.......x111.......In the Old Covenant the House of God was the temple in Jerusalem. It had clear specific purposes for Israel. In the New Covenant, the House of God was the home of every Christian--a clear specific change between the covenants. the 3 Places they met in the NT church--which we replace with Sunday worship...........the church in the Bible met together in 3 places. They fully realized what Jesus meant when He said "Where 2 or 3 are gathered in my name there I am in the midst". Wherever they met, the Christ inside of them operated--and they realized the potential of bringing that to the world. No "Office" of priest--No tithe........x118..........In the Bible only a priest collected a tithe. The Old Covenant had a specific priesthood--this priesthood is specifically done away with in the New Covenant and we are all made priests unto God--therefore there is no Christian who has the Biblical right to collect a tithe. They had all things--Common.......x119............The church of the Bible operated from a standpoint of commonness and brotherhood amongst themselves--just as Jesus had commanded and demonstrated. In our church system of today do we truly operate in this way? All teachers /repent from dead works..........x125..............The writer of the book of Hebrews offhandedly makes the statement to the people to whom he is writing that "by this time all of you ought to be teachers". Yet another Bible example of the gifts of ministry being "unto every one of us". All Teachers/ Stuck in 4th Grade..........x126.............Continuing the thought of the previous study, we ask the question where we came to our strict rules about whom can teach within our churches. authorities and powers--only found in the world.....x133..........The bible speaks on a few occasions about the operation of certain "authorities and powers". The Bible clearly is speaking about worldly government--yet most Christian churches operate by these concept of authority--which the whole word of God tells us is not to be in the church. Misunderstanding Hebrews 13:17.......x137...........When we misunderstand Hebrews 13:17, we are lead to operate our churches by undefined rule--the rule which is powerfully in the tradition of the church. Calling.....x145...........The word of God tells us that we are all called--and that this calling is our ministry. When we simply study the word calling from the Bible we will find that all are called to serve God--The Lord saved all of us with a purpose for our lives. The Devil Changed His Tactics--And we still haven't figured It Out! !......x148..........A history of the early church and it's governmental change during the Roman occupation of the church. History tells us where many of our wrong concepts about the operation of the church came from and we need to stop and ask ourselves why we still follow so many of these ideas today. church is not a building and office is not a room!.......x153...........Tradition has handed us certain concepts which are simply not Biblical--yet we still translate the Bible by our experience. When we read about "the church at Ephesus" do we think of a building with stained-glass windows--or do we realize that the church is truly and always people and NOT a place?. Disciples to Apostles.......x165..........Jesus gathered disciples (students) from the common people, He taught them for a brief period, and then He released them to be apostles--to all the ministry that He did!---Quickly, since ministry is a gift. Fit Your church Into the New Testament church.......x176...........The Bible describes a church which operated in a 7-day-a-week revival amongst all the people--in the homes of all the people. Does your church fit in with the Bible example of the church? Disciple to apostles--and back again!........x18............Ministry is a function--a gift--an anointing--NOT a title of rulership over others. When the followers of Jesus were being taught by Him they were called disciples (students)--when He sent them out to carry His ministry to others, they were called apostles (those who are sent). Ministry is a function! the format and the Pharisees........x180..........The Pharisees were the righteous authority of God in Israel, yet they had become bound by tradition, and specifcally Jesus said that they shut up the kingdom of God from the people--which means they stood against ministry in anyone but themselves. Flock of Ministers#2.........x178.........The word flock has been taken out of context, by church generations from the dark ages (specifically the Roman church) and used to lead us to believe that the church consists of a shepherd, who is, has, and does, all the ministry, and a "flock" of people who are functionless in God (other than to serve the needs of leadership) and have no ministry. The bible truth is that the flock is a group of ministers. Next Sunday, Burn the Offering..........x200804........"Offering" measn to destroy something in the earth as a sin payment to God (Jesus did this--right?!). If, we were going to truly follow the laws of the old covenant, we would have to destroy the offering---ooops no one wants to do that! NT church by OT Rules....x261............We operate ministry within our churches based largely on old testament ideas. We have a Levitical priesthood within the church. We build temples to God. Just these 2 concepts steal the ministry that the new testament says in supposed to be in all the body--and steals the priesthood that every Christians is supposed to be operating in. The clearly abolished old covenant ideas were placed in the church hundreds of years ago, and have been stealing the ministry and preventing Christ from being the Head of the church--and continue to do so today!. Pastoral Authority--something Like This?.......x265........Have you been taught something like this: God has set some people within the church--who are the ministry. They have God's authority over the others within he church, they "have the rule" and it is the Lord's will that we submit to this authority. If you have been taught these concepts--please open your Bible and read Luke 22:25-29--Matthew 20: 25-27--and Mark 10:42-45. X0623........Why wasn't Jesus born a Levite?........Why didn't Jesus come as a pastor? Why didn't He collect tithe? The bible says it is because He did not seek to glorify Himself. Walking through Ephesians......x3..........We are all saved with a purpose. Our salvation is a free gift--not by works--yet if we read this verse in context in the book of Ephesians, the word tells us that.."For we are his workmanship, created in Christ Jesus unto good works, which God hath before ordained that we should walk in them." (eph 2:10). What are the good works which we are to walk in? NOT the works of the law--we've been saved from them--rather the works of ministry--the working of the gifts which have been "given unto every one of us". 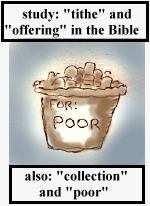 Spirit-lead Giving--Better than tithing.......x309.............The 1st century Jews who were the first Christians would have felt foolish if they paid a tithe. The tithe they had paid as jews was a sin payment--an offering for sin. It was clear that their Savior had paid the penalty for sin by offering His blood--once for all. They gave in a far better and effective way--by the leading of the Spirit. The Sunday Morning Whipping........x318.........the church in the Bible met anywhere the Spirit lead. One way was an assembling of themselves together (which was a long--perhaps days long meeting for all to be refreshed and filled with the Spirit)--this meeting was done only occasionally--as the Spirit lead. The daily meeting places were the homes of any Christian--or literally anywhere 2 or 3 were in agreement--including the temple of the people who were trying to put them in jail--the Jewish priest and elders! history has changed this--turned our meeting together from Spirit lead to law driven--and taken away the apostolic freedom which Jesus gave and translated it into the authority of man--thanks to the Roman empire!. They Broke Bread together........x342............The church after the day of Pentecost is described as having "fellowship" and "breaking bread together". When we read this things we lay on our concepts which come from tradition. We think this means they had social fellowship dinners together--and that they celebrated a ritualistic re-enacting of the Lord's supper. Wrong! Study the Greek meanings of these words and come to the understanding that they were actively serving God in these activities. Their fellowship was ministry, and their breaking of bread was a time to plan the activities that God wanted them to accomplish on a daily basis--what a great way to operate the church!. Purpose of the tithe//...... ....x346.......The purpose of the Old Covenant tithe was as the offering for sin. God needed blood to be shed, on a constant basis, in order to hold Israel's sin in forgiveness. It was therfore necessary for 1/10th of the herd of Israel to be made Holy--to made clean before God as sacrificial offering. The book of Hebrews speaks about the Levitical priesthood--declares it to be done away with in the the New Covenant--and then makes the clear statement that there is no more need for an offering in the New Covenant--we have the perfect, precious and pure blood of our Savior Jesus--amen!. Tithing Is Of The Law.........x348.......The tithe was the Old Covenant offering for sin. In the New covenant we have a better offering, the blood of Jesus, which is better than the blood of animals, or the offering of grain. The tithe is a legalistic doctrine and stand against the simple New Covenant teaching that ministry is a gift given unto every one of us. It singles out one person who is "the minister" and therefore limits the move of God in our churches. What if the demoniac of the Gadarenes Came to Your Church?........x369............This man was severely demon possessed. Jesus not only cast those demons out of the man--but released Him to ministry--which is exactly what he needed in order to keep the devil out of Him. Are we ready to do the same in our churches today? Or have we lost faith in the power of God--the power of the Christ within--to do ministry in even the most severely oppressed?. Why Didn't the Scribes Have authority like Jesus?.........x393...........The Pharisees were the right and correct rulers who had authority over Israel ( a little know Biblical fact in itself!). They did not have the same authority that Jesus had--because they wasted their authority with rule over others--with positions and title and satisfying man instead of God. Jesus demonstrated exactly what not to do with God's authority. We should not be like the Pharisees in any way. Doing the Opposite With Our Money...........x411.........In the Bible church, the money was freely given to anyone who had need. It supported the ministry of anyone who had need. The "church " which they were building consisted of people, not a large assembly hall. The building and operation of a building takes up most of our time effort and money in our church of today---Why? Your Cross = Your Ministry--and any man can have it!........x421.........Jesus explained authority and rule many times in His ministry--unfortunately we in the organized church largely ignore His concepts. Are we like Peter whom Jesus calls Satan when he wants Jesus to operate with worldly authority? Are we like the rich man who obeys the commmandments by law--but does not want to give his money to the poor and give up His rule or authority?. Galatians chapter 1:1-15 New Living Bible........x56..............Paul makes a big point at the beginning of Galatians, relating the fact that he did not receive his ministry from other people--specifically NOT from the elders or other apostles--he did not receive his ministry by submitting to authority!. How did Paul become a minister?........x207..........Paul the apostle said that he received his ministry not from man--but as a gift from God directly. He taught ministry as the gift of Christ--not as a qualification from man, a degree from a school, or a reward of working one's way through a church system. Is he the exception or the rule? And if not the rule, who has the right make the rules of ministry qualification--man or God? Hey Jesus--How Can we Get into Ministry? ?........x200...........Some of the followers of Jesus asked Him how they could do the same stuff that He did. He gave them an interesting answer--"eat me as meat and bread". What did this mean? It spoke of the priesthood of Aaron--but don't well all eat the bread of the Lord's supper as Christians?. Every mans' calling.........x2............The Bible tells us that every man has a calling--and that calling is to serve God---ministry. The Link of What Leadership is--"Hegiomai".......x243.........According to the Bible, someone has the "hegeomai". The King James Bible translates this word as "have the rule over"--whether we know it or not, Jesus translated the very same word as servant, who does NOT exercise authority over others. Priests and Levites--the bad guys........x516...........Ever read the story of the good Samaritan? Sure you have. And certainly you caught the important lesson on how we ought to always help others who are in trouble. But did you ever study who the "bad guys" are in the story? Jesus was sending a message to Israel 2,000 years ago when He named the priests and Levites as people who only want to serve God in a nice clean temple, and don't want to do the "dirty work" that Godly ministry really is. Well, we don't have Levitical priests in our churches today---or do we??. added to the church by being the church.....x114.............The Bible does not tell us to "go " to church--it tells us to "be" the church. In the book of Acts people were all serving the will of God in commonness and unity and love---isn't this the high calling of God?. Watchers of ministry----How Jesus Dealt with It......x182.......Jesus demanded that everyone who followed Him be a priest--that all His followers served God. In our system of church today we need the majority of people to be watchers and consumers of ministry--who is right--Jesus or us?. All Are Partakers of the Altar.......x116.........The priesthood and therefore the ministry of every Christians is spoken of in many places in he New Testament. We are all made priests unto God in this new Covenant we therefore all have a ministry to do for Him. Apostles--someone who is sent--not a title to bear........x117.........Apostolic ministry was Jesus' first concern and the same can be said of the early church. Just what is an apostle? Do we have a clear Biblical understanding of this most important Bible ministry? Purpose of the tithe.......x282...........The purpose of the tithe was a sin offering. God considered 1/10 of Israel's herd and grain as "Holy". A Holy thing had to be offered to God in order for Him to forgive sin. Holy blood had to be spilled for forgiveness to come. Of course we know that we as Christian do not offer grain nor animals (which is what the tithe consisted of!!) in order to have our sin forgiven--Why? Because we have the once-for-all sin offering of the blood of Jesus. No more sin offering needed--therefore no more tithe. The church in the Bible recognized this--it freed up their giving, so they gave to the poor and the lack within the church--for any needs-----why don't we do it this way? Assembly and church--2 different things....x170...........We have tradition, whether we realize it or not--that has lumped together the concepts of the House of God--the church--and the assembling of ourselves together. Yet these things Biblically are different--they are not a weekly church service in one building --which we spend most of our time, effort, and money, operating. Not Exercising authority over one another--a NT Change from OT.........x135..........In the Old Covenant, there were only some people who operated under God's authority--and therefore had authority over the rest of Israel. But Jesus clearly changed this in the New Covenant. The question is this: do we operate the church on Old Covenant or New Covenant ministry principles? By What Authority?......x143..........The Pharisees Questioned Jesus' authority--His right to perform ministry. Jesus, clearly operated His ministry outside of the rules of the Old Covenant (He was not born a Levite--etc). Whether we realize it or not, we operate our churches largely by Old Covenant ministry principles--principles which have been clearly changed in the New covenant. church attendance--the prerequisite to ministry.........x152...........In order to be in "official" ministry within any church--one must submit to the authority within that church, and regular church attendance certainly is a pre-requisite. But, is this Biblical? DAKE.......x160...........Dakes study Bible, a well respected Bible companion written over 50 years ago, defines ministry in this way, and has interesting statements on authority and ministry. The understanding of the anointing--and the understanding of the anointing gifts........x187...........We don't understand ministry partly because the functions of ministry are in Greek (and Latin)--apostollos--prophetes--evangelistis--pastors--words which are left in Greek by translators of another age--and we still translate the Bible in this way (until you came across this website!). SOWING--FRUIT---SEED........x306.........We receive fruit from God--through the seed of the word--from the Spirit which is poured out upon us. But inside of fruit is seed--which needs to be planted in order to bring in the next harvest. Ministry is simply the act of sowing seed. Our churches are filled with good folks, Spirit-filled--full of the word--who have lots of fruit rotting on the vine. We are not taught to be sowers--we are taught to only allow the special "some" of ministry to be allowed access to our good soil--so when we don't believe in one anthers' ministry--how can we grow?. Victory and the Gifts--a quick overview........x188.......The ministry gifts are God's plan for victory over sin -sickness- and -Satan. But over history, Satan has pulled out all stops to limit their use. Satan quotes out of context--Jesus puts it in context!.........x512.......When Satan tempted the Lord, he used out-of-context Bible verses, to get Jesus to act against God's will. Jesus' answer was to put the word in the context that God set it in. We ask you to always check any teaching -(including ours!) with full Bible context---and more deeply--are we really operating the church in the correct Biblical context? 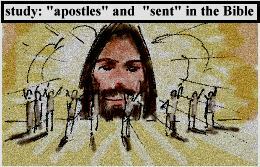 The Hidden Apostles............x120...............The word "apostello" is used hundreds of times in the New Testament. Jesus and the church in the Bible operated by apostolic authority. This study simply relates all the scriptural uses of this word. minister---diakoneo..........x121..............A minister is a servant. Ministry is service to others--and specifically NOT authority over others. Study all the uses of this word in the Bible. Judas had a ministry!..........x173...........Ministry is simply service--and everyone serves someone--whether we realize it or not. One can be a servant of Satan--or pose as a servant of God--Judas was a servant of God who sold out to the devil--but he was still a servant--we all serve someone. freely ye have received, freely give.........x183............Sowing and reaping is the process of ministry. The Bible tells us that we have received Christ freely--and we are to give freely also. The Christ, the gift of Christ we have each received, is meant to be given freely--this is what ministry is: Christ inside of each of us reaching out to others. Division is really God's multiplication!.......x19...........Jesus' first concern in His ministry was to find apostles--people who would do the same stuff that He did. Jesus literally divided Himself into 12--He understood that Godly principle of dividing and releasing. Have we invited spirits into our church system which work against this plan of God? Do we really want revival?.......x13............Written by Charles Finney many years ago, this study points to the lack of ministry within the system of the church as we operate it. The Expectation of "Ministry"....x175.........Our concept of ministry is a person who is better than the rest of us--closer to God--more important to God in some way. We are carrying hundreds of years of misconceptions and traditions with us in Christianity. History of Britain King Henry the 8th.....x157.............The history of Britain relates the history of church government and the ties it had and still has to worldly governmental concepts.